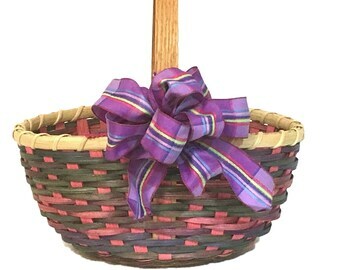 Announcement Bright Expectations Baskets specializes in traditional hand woven baskets. Table baskets, storage baskets, laundry baskets, wall baskets, serving baskets, market baskets... baskets of every type, color, and size. Baskets have a never ending list of possibilities for their design and their purpose. Enjoy browsing the "Ready-to-Ship" shop section for quick delivery options. You can always contact me for your custom basket requests too! Basket weaving patterns and kits are available for all levels of weavers. Patterns and kits are based on my own original designs and concepts and are immediately available after purchase by digital download - no more waiting on snail mail to arrive. More patterns are in the works, so please check back often. The newest addition to my shop is a section for "Basket Weaving Supplies". You'll find a variety of miscellaneous items for basket weavers there. I can also have custom hard wood bases (not pine) made for you in any size or shape. Pre-finished bases (stained and polyurethane sealed) are also an option. 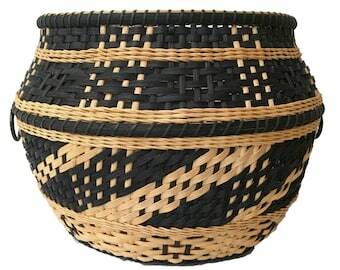 Bright Expectations Baskets specializes in traditional hand woven baskets. Table baskets, storage baskets, laundry baskets, wall baskets, serving baskets, market baskets... baskets of every type, color, and size. Baskets have a never ending list of possibilities for their design and their purpose. Enjoy browsing the "Ready-to-Ship" shop section for quick delivery options. You can always contact me for your custom basket requests too! INVENTORY REDUCTION SALE - Easter Basket, Special Occasion Basket, Flower Girl Basket - "Mimi"
I love this basket! The "knot" really makes it special. This will make a beautiful Easter Basket! Beautiful basket. I love Farmer's Market type baskets. Well written pattern ... as always! I love the design for the bottom of this basket. It will be my first time making one like this and I am confident the directions will get me through it. This was shipped very quickly and I can't wait to start it! Update: 3/14/19 - I finished this basket yesterday and it is beautiful! I would highly recommend this kit. I love the patterns from BrightExpectations! Well written and easy to follow. Loved this basket kit. Supplies were more than adequate and great quality reed. Instructions were well written and easy to follow. I highly recommend. It's art show time - baskets aplenty. A tisket, a tasket, my oh my do I have baskets. Big baskets, small baskets, tall baskets, short baskets. I love this show - artists not only get to show the finished baskets but also techniques. Single walled baskets and double walled baskets. I love to create baskets. I love the challenge of figuring out a new basket design or pattern. I love working with a buyer on a custom order. I love weaving with some awesome friends. I love looking at baskets. I love using baskets. Well, I guess I just love baskets, lol! Some great friends (my fellow "BasketCases") and I took a class at a local museum and we were hooked from that day forward. We call weaving our "therapy" and use that time to catch up with each other's lives and families. It's always nice to have someone to help you work through a difficult design (and keep you from making it fire kindling) and another weaver's perspective gives you inspiration. I have always loved learning a new craft or hobby - and just ask my husband, I have a LOT of them. But weaving baskets is by far my favorite. There is something about looking at a roll of reed and having a vision of the end product that is exciting. I am always looking for new ideas and don't often follow an exact pattern. Some days I just grab some reed and free form the design as each row progresses. My friends and I sell our baskets at arts and craft fairs. For me to decide to sell my baskets on Etsy has been a challenge and I have a lot to learn about the whole process. When you pick up a basket, you can feel the quality and see the detail and work that goes into each completely handmade piece. It is difficult to convey that in a picture and words but I am giving it my best shot. I wish that each one of you could drop by the weaving studio, have a cup of coffee, browse through the inventory of baskets, and just chat with me and the girls. If that's not possible, then please enjoy looking at my listings and always feel free to send me a message. May you have a blessed day filled with "Bright Expectations! Designing and creating baskets is a passion for me. I love weaving a basket to either serve a purpose or a specific function, to fit a designated space, or as an artistic piece of decor. There is beauty in the most simple or complex basket. Sherri (owner of Sew-Ray-Me) is a friend and entrepreneur with a custom sewing and stitching business. We collaborated on ideas and designs and she brought the tags to life. I couldn't be more proud to have her create these unique tags for me to offer in my shop to other basket weavers. I welcome custom basket requests! Just message me your specifics and I'll be happy to work with you to weave just the basket you are looking for. I'll need dimensions, color, and pattern/design changes if they differ from one of my listings. Or just send me a photo of one you have found and I'll try to duplicate it. By purchasing or downloading a pattern from Bright Expectations, you are purchasing a license to use the pattern for PERSONAL use and agree to the following terms: All digital images and/or sample images contained within are Copyright © Becky Bechtel / Bright Expectations LLC, and all rights reserved. Each pattern is for your personal use only and is not to be redistributed in any way, used for commercial purposes, or claimed as your own. For what you can and cannot do with a purchased pattern from Bright Expectations, please reference additional pertinent information contained in the listing. How will my basket be shipped? Shipping is normally provided by USPS Parcel Select. Depending on your location and/or the size of the basket, Priority Mail may be available at no extra cost and I will compare on each shipment. Priority or Express Mail are always available at an additional fee, if you choose. Each buyer will be provided a delivery tracking number once the item ships. If you would like "signature required", please let me know and I will add. Larger items may be shipped by UPS or FedEx. For shipment outside the continental U.S., please contact me for estimated pricing.